How's everyone surviving the summer heat? We are well into July now, and gardens seem to be overflowing here in North Carolina. 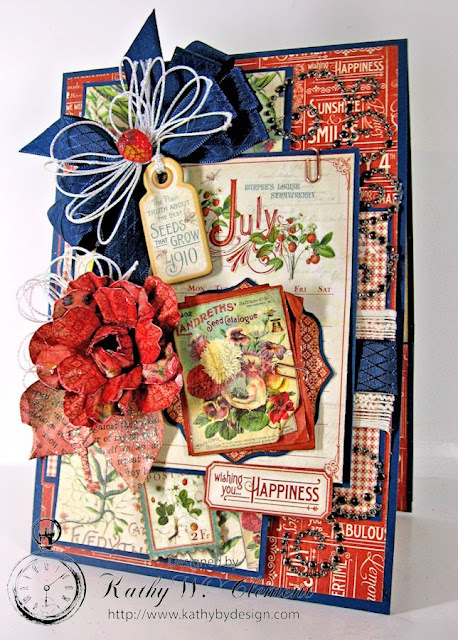 I was inspired to get out my Graphic 45 Time to Flourish papers and created another fun pocket card that I've embellished with elegant Navy Diamond Satin Ribbon and shimmery Iridescent White Metallic String from Really Reasonable Ribbon. This 5" x 7" top fold card is such a fun design. To make the base from an 8.5" x 11 sheet of navy cardstock, cut the cardstock on the short side at 5". You'll have a 5" x 11 rectangle. Cut two more 5" panels from the leftover piece, and then carefully join them to the base of the 5" x 11" panel using glue or 1/8" Scor-tape. Try to overlap as little as possible. Next, score this long rectangle at 7" on the long side and fold. Score again 3" down from the open end of your folded cardstock. Fold this up and you've created a 3" deep pocket on the inside of your card. I added lots of layers and fussy cut elements to my card front, matting everything with navy cardstock. I tied my beautiful bow with the help of my trusty Zutter Bow it All and then topped it with a tag, a loopy string bow, and a vintage strawberry button. 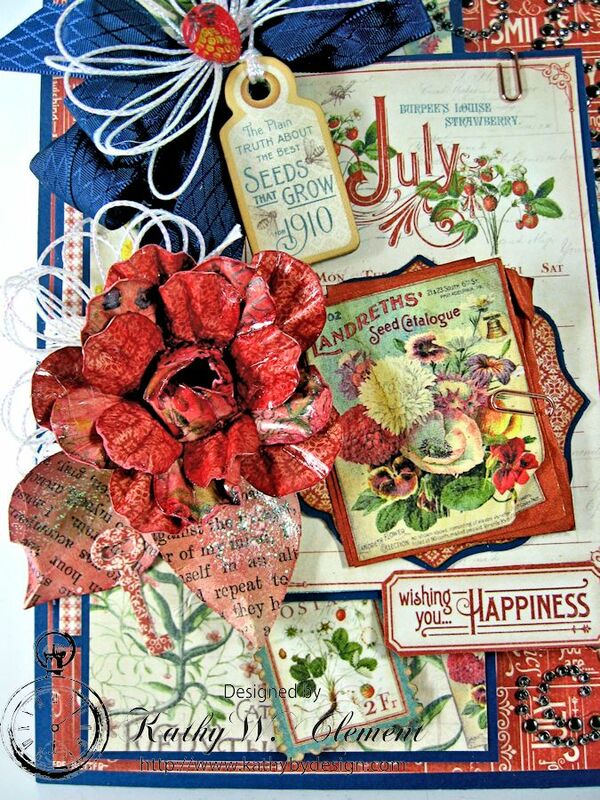 The flower was created with the Time to Flourish punch out flowers. I sponged all the edges with Aged Mahogany Distress Ink, spritzed the back with a little water, rounded out the petals with a stylus and then pinched the petals together to create ridges. After glueing all the layers together, I painted the petals with Glossy Accents to give them even more shine. 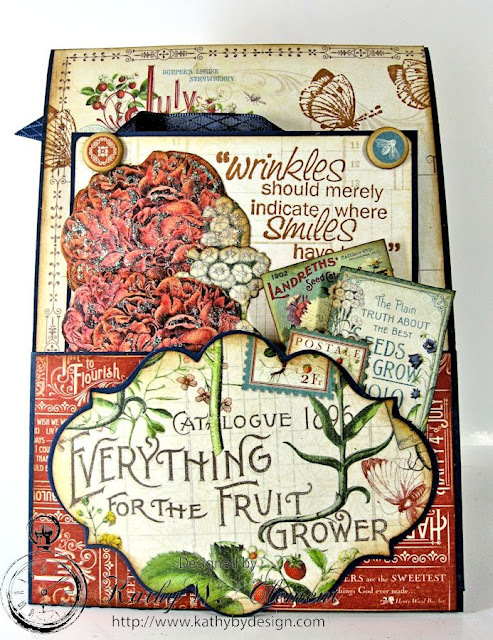 I hand cut leaves from an old book page and painted them with GA, too. The belly band on my card was created by layering Cream Mesh Ribbon with the Navy Diamond Satin Ribbon. It just adds such lovely texture to the card. The inside of the card is decorated on both the top and the bottom. I looped some ivory burlap string under my little tag to make it stand out on the page. 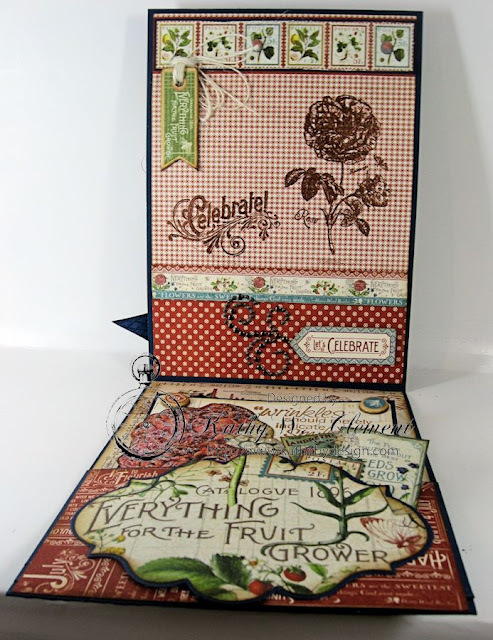 The Time to Flourish stamps were embossed with copper embossing powder. And here's the pocket I was telling you about. 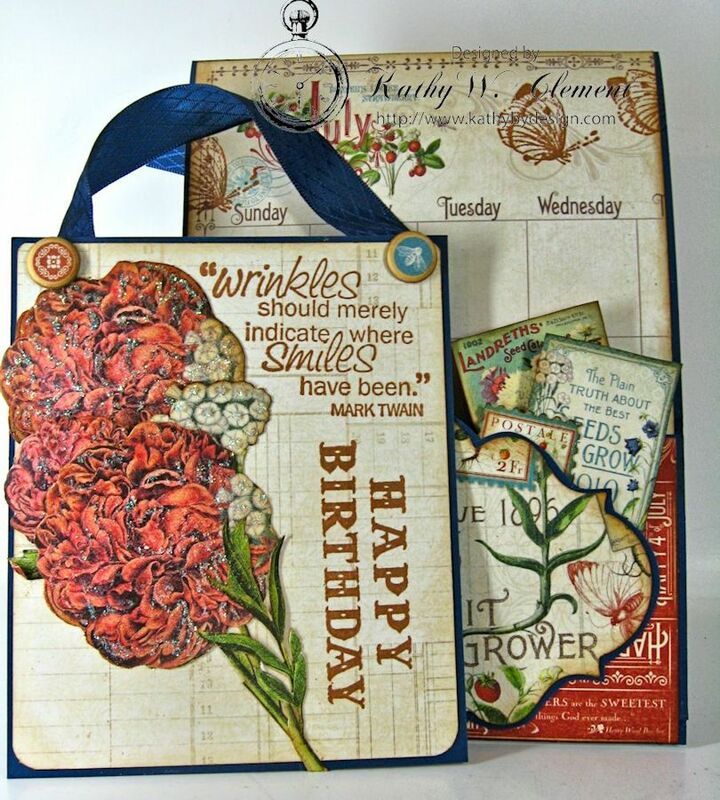 I filled it with a little birthday hanger that features stamped greetings and fussy cut roses from the paper collection. There's plenty of room in the pocket for a gift card, too! 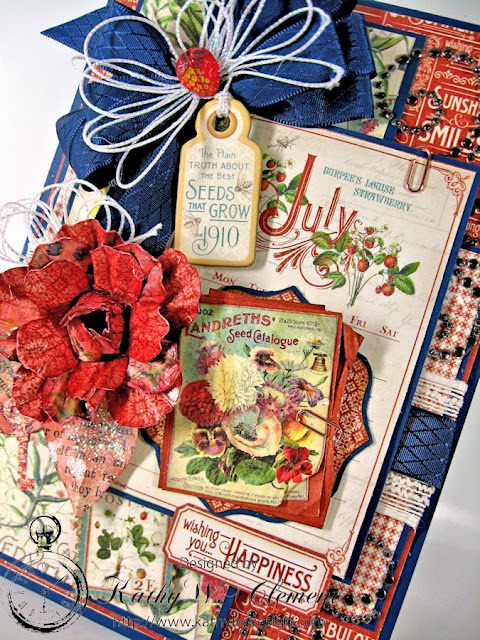 It's fun to create flowers that won't wilt in the heat! Kathy!!! This is absolutely FABULOUS!!! Love it! Hi, is there a video to make this beautifull bow also?